﻿Researchers at the University of British Columbia and the Paul Scherrer Institut (PSI) in Switzerland have created a microneedle drug monitoring system that could one day replace costly, invasive blood draws and improve patient comfort. The research was published in Scientific Reports. The new system consists of a small, thin patch that is pressed against a patient's arm during medical treatment and measures drugs in their bloodstream painlessly without drawing any blood. The tiny needle-like projection, less than half a milimetre long, resembles a hollow cone and doesn't pierce the skin like a standard hypodermic needle. "Many groups are researching microneedle technology for painless vaccines and drug delivery," said researcher Sahan Ranamukhaarachchi, a PhD student in UBC's faculties of applied science and pharmaceutical sciences, who developed this technology during a research exchange at PSI. "Using them to painlessly monitor drugs is a newer idea." 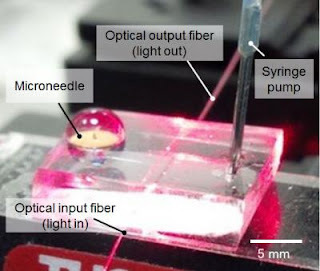 The microneedle created by Ranamukhaarachchi and his colleagues was developed to monitor the antibiotic vancomycin, which is used to treat serious infections and is administered through an intravenous line. Patients taking the antibiotic undergo three to four blood draws per day and need to be closely monitored because vancomycin can cause life-threatening toxic side effects. "This is probably one of the smallest probe volumes ever recorded for a medically relevant analysis," said Urs Hafeli, associate professor in UBC's faculty of pharmaceutical sciences. "The combination of knowhow from UBC and PSI, bringing together microneedles, microfluidics, optics and biotechnology, allowed us to create such a device capable of both collecting the fluid and performing the analysis in one device," said Victor Cadarso, a research scientist and Ambizione Fellow at PSI. Originally published by University of British Columbia.